The official facebook page for Gonzalo Lopez-Gallego and Dimension Films' upcoming sci-fi thriller Apollo 18 has been updated with a timeline recording the U.S. & USSR space race. Interestingly this appears to provide clues to the mystery surrounding what happened during the secret NASA mission. Apollo 17 was officially launched December 17th 1972 and was believed to be the last manned mission to the moon. But in December of 1973, two U.S astronauts were allegedly sent on a secret mission to the moon funded by the US Department of Defense. While NASA denies its authenticity, others say it's the real reason we've never gone back to the moon. ShockTillYouDrop get all the credit for observing the update. If you wanna recap on the whole deal you can check out the trailer here. Apollo 18 hits theaters on September 2. 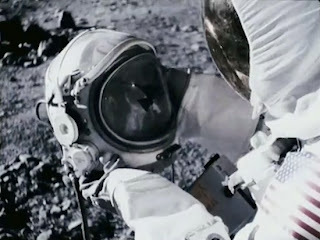 I'm reading: Clues To What Happened on 'APOLLO 18' Buried In Dimensions Film's Revealed Space Race TimelineTweet this!